Ian Wilkes announced last month that Cicatrix was injured. No explanation. DOes anyone have an update or know what happened? Troublewithatee appeared to suffer a bad breakdown at Mahoning Valley R4. Onde Ah Mo appeared to go wrong in the 1st at Santa Anita, a 1 mile MSW taken off the grass. I'm worried because Franco was trying to pull him up but, after they left the camera view, was unseated from the horse. A riderless horse will often try to keep moving, creating further injury. BaroqueAgain1 wrote: Onde Ah Mo appeared to go wrong in the 1st at Santa Anita, a 1 mile MSW taken off the grass. I'm worried because Franco was trying to pull him up but, after they left the camera view, was unseated from the horse. A riderless horse will often try to keep moving, creating further injury. Onde Ah Mo has been euthanized following his injury in the first race, according to the Santa Anita stewards. Cash Prize went down near the wire in the Camilla Urso (may have that spelling wrong) at Golden Gate, and that caused another horse to fall as well. Have to say that I don't see many breakdowns on GG's synthetic...maybe they clipped heels? Boom Boom Bango leaped in the air leaving the gate in the 9th at Santa Anita, and then appeared to wrong heading down the backstretch. Dial Me In was clearly injured in the 3rd at Santa Anita when the leader, Wild Lando, veered out sharply in the stretch, slamming into DMI, who then hit Faversham. Faversham was able to finish the race, but I think Dial Me In went down. BaroqueAgain1 wrote: Dial Me In was clearly injured in the 3rd at Santa Anita when the leader, Wild Lando, veered out sharply in the stretch, slamming into DMI, who then hit Faversham. Faversham was able to finish the race, but I think Dial Me In went down. Dial Me In has been euthanized after he fractured his shoulder during the incident in the third race at Santa Anita, trainer Jim Cassidy said. This incident is a sad reminder that when half-ton horses run into each other at 30-40 mph, bad, bad things can happen. Whenever I hear someone say, 'they should just let them play,' whenever stewards DQ a horse for contact during a race, I just want to scream #^%& #%^, #%^ #^%&! *@ idiot!!! The Player eased turning for home. Great job by Calvin to pull him up quickly when he was stopping. My thoughts are with him and the Bradley's. I am sick about The Player. Hoping for positive outcome. Have known this colt since he was a foal. Lots of us got to know him a little with the stories about his habit of sitting down and photos of him laying his head under his stall webbing so he could beg for more treats. I really hope the big goof can be saved, but 'fracture in right front' sounds ominous. 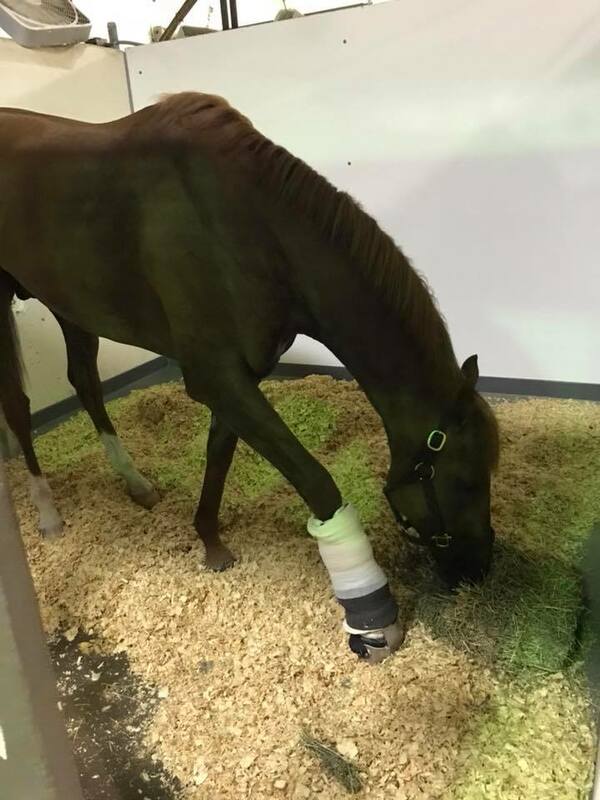 The Player, the popular chestnut horse who was pulled up on the far turn as the favorite in the New Orleans Handicap, fractured both sesamoids in his right-front leg, trainer and co-owner Buff Bradley said about a half-hour after the race. "Obviously we're trying to save him. Right now we’re sending X-rays to the surgeon to see what to do," said Bradley. The Player took the lead before the first turn Saturday under Calvin Borel but after setting a moderate pace to the half-mile pole he was overtaken by two horses, lost his position, and began to fade. He took no obvious bad step but was pulled up at about the 5/16 pole in distress while staying on his feet. The Player was fitted with a Kinsey splint, walked onto the equine ambulance, and taken back to Bradley's barn. We'll update this story at drf.com as more details become available. My trainer asked me if I wanted to get up today. I mean really, didn’t I do enough yesterday? — at Fair Grounds Race Course and Slots. Judging by that photo, The Player is a reincarnated Irish Setter. Didn't we recently lose Mourinho to a similar injury? Maria Kabel is with William Buff Bradley and 2 others. BaroqueAgain1 wrote: Judging by that photo, The Player is a reincarnated Irish Setter. I'm no vet but a lot will depend on the severity - clean break, or fragments? etc - and if they can maintain blood supply to the ankle/hoof, if there are complications during/after surgery, if laminitis develops, if colic develops... so many things can go wrong even if everything goes right. The Player will undergo surgery Monday at the Louisiana State University equine hospital in an attempt to repair his broken right front leg. The Player fractured both right front sesamoids, bones in the ankle joint, during the running of the New Orleans Handicap on Saturday at Fair Grounds. The Player was pulled up on the far turn by jockey Calvin Borel, splinted, and vanned back to trainer and part owner Buff Bradley’s barn at Fair Grounds, where the specific nature of the injury was diagnosed. “So we will try to save him but know it won't be easy and we will not let him suffer,” Bradley said. Even if the surgery succeeds, horses run the risk of contracting laminitis, which often proves catastrophic, during recovery from such injuries. I feel so bad for them. The Player's been such a special horse in that barn and on the farm. It may take a miracle to save him, but miracles have been known to happen. Sparrow Castle wrote: I feel so bad for them. The Player's been such a special horse in that barn and on the farm. It may take a miracle to save him, but miracles have been known to happen.